Who designed Shell Love Bug? How many hours were spent sorting and adhering shells? Rambo and the volunteers dedicated over 1,200 glueing hours to the project, which was completed in 34 days. How many shells are on Shell Love Bug? Over 20,000 shells adorn the beetle, all of which are native to Southwest Florida beaches. How many species of shells does Shell Love Bug feature? How are the shells attached to the car? Over 100 tubes of Shoreline Marine GOOP, 3.7-Ounce, Clear were used for the shell application process. How much do the shells weigh? The combined weight of the glue and shells is over 200 pounds. 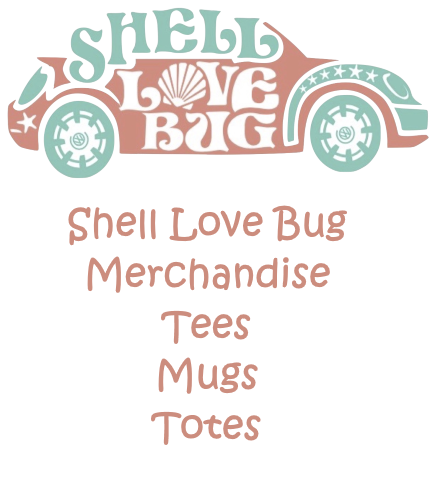 Can Shell Love Bug be washed? Yes, the car can be hosed off with fresh water and soap, using a soft brush for details. Who owns Shell Love Bug? Pam Rambo Owns the Copyright to the artwork of Shell Love Bug. The Lee County Visitors and Convention Bureau owns the title to a 2005 VW Beetle. How can I see Shell Love Bug? 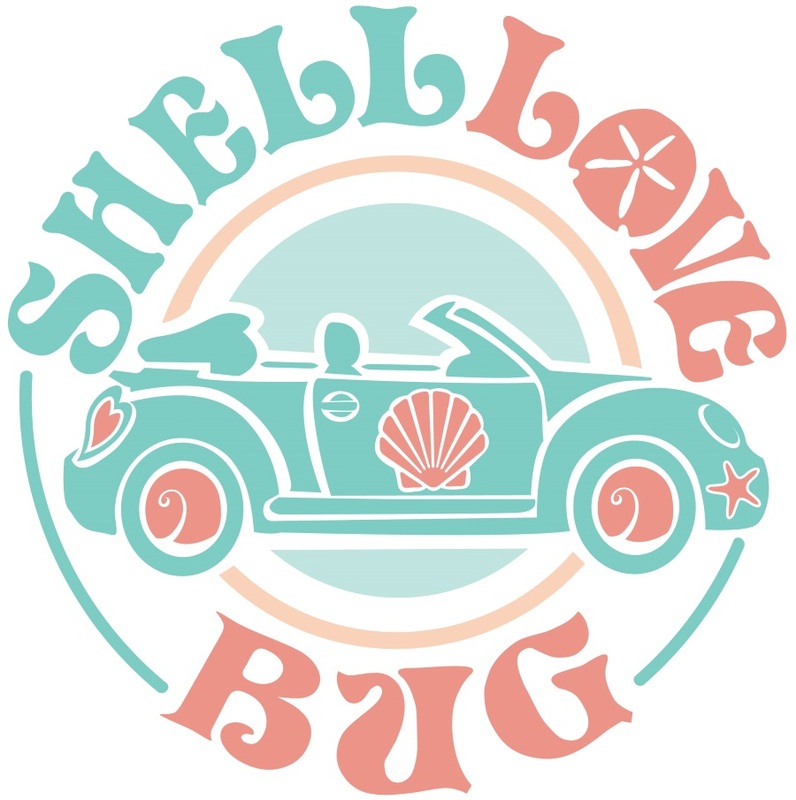 Following its debut on 2016 National Seashell Day, Shell Love Bug will appear at designated locations and special events. Check the Calendar of Events (CLICK HERE FOR link) regularly for updates. Some day, Pam, can you give us really, really, close up’s of the “Shell Bug”? I and those of us unable to see it in person would really enjoy close up’s of the shell groups on the car. I did see some under the pictures on the web, but beg for more. 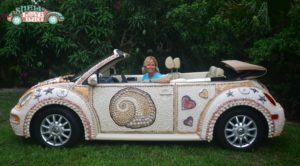 Is the shell lovebug on display for the public anywhere in Florida?? I Love your work. we are in Sanibel in March.5 . can i see with my Mom (70.Birthday)your Car ? I am in charge of our Christmas parade for our community in Rotonda West. Your Love Bug is amazing and was wondering if you would like to be a part of our annual parade this year. It is Saturday December 2 rain date Sunday the 3rd . It would’ve be an asset to our parade. Please consider if at all possible. I work at Cape Coral Arts Studio, part of Cape Coral Parks and Rec. I am wondering if you could be a guest speaker and bring the Shell Love Bug for our Fine Arts For Kids Camp? Who should I contact to try and set this up? We will be in Sanibel from September 4 -9. 2017. Will the Shell Love Bug be anywhere close so we can see it? How do we contact you to have you come to an Event? Hi, I am currently staying in Sanibel. Is the Shell Love Bug on display anywhere for the public? I’m not able to quantify how many tourists and, more importantly to you and to the Lee County’s Tourism Development Board, how many tourist dollars Pam and Clark Rambo have brought to Lee County and the Sanibel Island communities over the years through the “I Love Shelling” website and Pam’s “I Love Shelling” blogs. I would venture to say it would far outweigh the depreciated value one older model Volkswagen Beetle has on your books by a very, very large margin. I can say without reservation that neither I, my extended family nor the many friends I have shared Pam’s blog with every year would have ever visited or considered investing in property in Lee County had I not been reading and following Pam’s “I Love Shelling” blog and using Pam’s website as a valuable reference tool to gain more knowledge of your area and of shells all these years. We had never heard of Sanibel Island except in passing as a rather overpriced tourist location until I read Pam’s blog. We would yet be unaware of your beautiful beaches with their shelling treasures from the sea had we not seen her beautifully crafted videos. We would also have known nothing of your yearly Shell Festivals and the many opportunities for shelling vacations and trips available in your area had Pam not made them known and easily accessible to us as her readers. I believe if you will consider all of the above points, weigh them against the bad publicity your county commission and your area is currently receiving due to this controversy you might find writing this depreciated asset off to public relations and signing the title and registration over to Pam Rambo would have a much more positive economic effect than the current value of the asset. Without Pam’s incredible artistic talent, her and her many volunteers’ dedication, generosity and hard work, the donation of shells from Pam’s prized, private collection and the donations of so many fellow shellers of their “prized shells” from their personal collections this vehicle would not be worth much on the open market. The “Shell Love Bug” can however continue to act as a good-will ambassador for your county in Pam’s possession. Please act responsibly in this matter by carefully weighing the economic effect of your decision on the outcome.